When the Brotherband crew are caught in a massive storm at sea, they’re blown far off course and wash up on the shores of a land so far west that Hal can’t recognize it from any of his maps. Eerily, the locals are nowhere in sight, yet the Herons have a creeping feeling they are being watched. Suddenly the silence is broken when a massive, marauding bear appears, advancing on two children. The crew springs into action and rescues the children from the bear’s clutches, which earns them the gratitude and friendship of the local Mawagansett tribe, who finally reveal themselves. But the peace is short-lived. 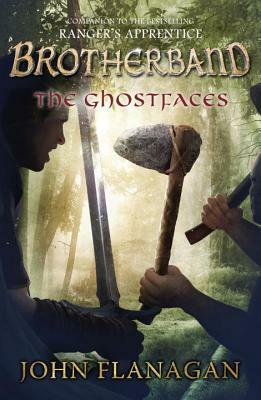 The Ghostfaces, a ruthless, warlike tribe who shave their heads and paint their faces white, are on the warpath once more. It’s been ten years since they raided the Mawagansett village, but they’re coming back to pillage and reap destruction. As the enemy approaches, the Herons gear up to help their new friends repel an invasion. John Flanagan grew up in Sydney, Australia, hoping to be a writer, and after a successful career in advertising and television, he began writing a series of short stories for his son, Michael, in order to encourage him to read. Those stories would eventually become The Ruins of Gorlan, Book 1 of the Ranger’s Apprentice epic. Together with his companion series, Brotherband Chronicles, the novels of John Flanagan have now sold millions of copies and made readers of kids the world over. Mr. Flanagan lives in the suburb of Manly, Australia, with his wife. In addition to their son, they have two grown daughters and four grandsons.